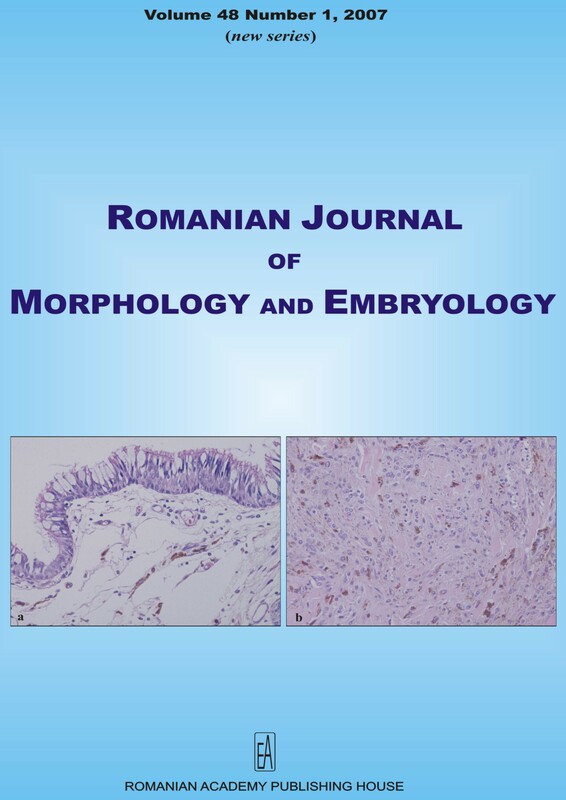 In this report, we examine several morphologic aspects of blue nevi of internal organs, and compare them to similar conditions of the skin. From a morphologic point of view, blue nevi of internal organs are more similar to the so-called dermal melanocytoses. Nevertheless, since melanocytoses and blue-nevi seem to have the same benign prognosis, and since blue nevus is a historically consolidated term to refer to pigmented spindle cell lesions of internal organs, a most appropriate term, to refer to the latter, will not be easily accepted in literature. There were investigated 15 cases with normal thymus removed during cardiac surgery and nine cases with clinical signs of myasthenia gravis. Four patients with myasthenia gravis had thymoma (three invasive, one non-invasive). Specimens were fixed in buffer formalin, embedded in paraffin and slides were stained with Hematoxylin-Eosin and Alcian blue-Safranin. Additional slides were stained for factor VIII in order to estimate microvessel density. Mast cell density was performed at magnification x400, and microvessel density at magnification x200, using the "hot spot" method. There were found intralobular mast cells in all cases, located mainly in the cortex (6.53 in the normal thymus, 21.4 in patients with myasthenia gravis, and 10 in thymoma-associated myasthenia gravis). A significant increase in the number of intralobular mast cells was noticed in patients with myasthenia gravis without thymoma (p<0.001), and a moderate increase in patients with thymoma-associated myasthenia gravis (p<0.023). Values of microvessel density were 10.3 for the normal thymus, 33 for myasthenia gravis without thymoma and 21.8 for myasthenia gravis with associated thymoma. A strong correlation was found between the number of mast cells and microvessel densities in all three conditions. Formation of new blood vessels from a preexisting vascular bed (angiogenesis) is a complex multistep process, which may also permit metastasis. Estrogen and progesterone are important in breast tumorigenesis, and their effects on the breast are mediated by their respective receptors, the estrogen receptor (ER) and the progesterone receptor (PR). To investigate how tumor angiogenesis correlates with ER/PR status in breast carcinoma diagnosed on core biopsy, microvessels were counted (and graded the density of microvessels) within the initial invasive carcinomas of 158 patients. Using light microscopy, the number of microvessels was counted manually in a subjectively selected hot spot (in the most active areas of neovascularization per 400x field), and their values were separated as above or below median (low and high), without knowledge of the outcome in the patient or any other pertinent variable. When the mean values of MVD of the various groups defined by ER/PR status were compared, significant difference was noted (P = 1.57E-05). When tumors were classified as high or low MVD, based on a cut-off value (30.70175 microvessels/square-mm), cases with high MVD were significantly more numerous in patients with ER+/PR- status. MVD did show a relationship with groups defined by ER/PR status (P = 0.000801). Assessment of tumor angiogenesis may therefore prove valuable in selecting patients with early breast carcinoma for therapeutic hormonal therapy. The hepatic venous outflow may be diminishing in right-sided heart diseases, constrictive pericarditis, obstruction of suprahepatic veins or an inferior vena cave. It was created an experimental model by obstruction of the suprahepatic veins lumen and inferior vena cave, too, at the adult Wistar rats. The animals were sacrificed in the 30 days after operation. At the iterative laparatomy it was found the liver more increased in volume, a little amount of ascites in peritoneal cavity, edema of the digestive organs walls. Liver and stomach fragments were prelevated and were processed for optic microscopy and electronic microscopy. The morphological study using by usual techniques has highlighted vascular stasis in gastric submucosa. In liver, it is standed out the pericentrolobular vascular stasis, inflammatory lymphoplasmocytic infiltrate around the end of hepatic vein. In the gastric submucosa have found vascular stasis, and within the chorion mucosa, the high capillary hyperemia. There is a discreet vacuolar feature on epithelium surface of the gastric mucosal in pyloric region. In the other layers, at rats the epithelium multistratum keratinizated of the stomach is without changes, in this region is maintaining the hyperemia in mucosal chorion. The aim of the study was to demonstrate the value of the double immunostaining for endothelial and perivascular cell to discriminate mature from immature tumor-associated blood vessels in mammary carcinoma. We used the specific endothelial marker CD105 to highlight the activated endothelial cells and antibodies against smooth muscle cell actin (SMA) for perivascular cells, applying Envision Doublestain system (HRP/DAB-APAAP/Fast Red). We found an inverse correlation between the immunoexpression of CD105 and SMA in normal vessels and a strong positive signal for CD105 in the intratumor single endothelial cells and immature vessels. Only few blood vessels were positive for both CD105 and SMA within the tumor area. The signal for the endothelial marker was weak and inconstant, and significantly diminished when the SMA immunoexpression was increased for the same vessel. The differentiation between vessels with and without perivascular cells coverage using double immunostaining for CD105/SMA may be an important step in the selection of the mammary tumors, which could have a high grade of responsiveness to antiangiogenic therapy with monoclonal antibodies against CD105 antigen. Atherosclerosis is a complex process that affects specific tissues of the vasculature, susceptible to developing atherosclerosis. From 10 patients with atherosclerosis, between 50-70 years, peripheral blood was prelevated and after the technical procedures, the blood cells were studied using the electron microscopy. The most characteristic morphological modifications were observed in agranulocytes and platelets. The granulocytes polymorphs showed insignificant ultrastructural changes, and the erythrocytes presented weak anizocytosis and poikilocytosis. Cholestasis includes, as a syndrome, all clinical and biological manifestations caused by the deficient or simply absent biliar secretion or caused by the obstruction of the biliary ducts. The hepatic cholestasis from the chronic hepatitis C (HC VHC) is a result of the altered interlobular biliary canalicules, caused by the modified cellular transport mechanisms and it is associated with a medium to severe degree of fibrosis. The aim of this study was to evaluate the efficiency of antiviral therapy in HC VHC patients. The study included a number of 37 HC VHC patients admitted at the Medical Department no. 1 of the Emergency County Hospital of Craiova; they were treated with Pegasys, 180 micro-g/week and Copegus, 1000 or 1200 mg/day, taking in consideration their weight, for 48 weeks and they were monitored for 24 weeks after the treatment. The following parameters were analyzed: direct bilirubine, total cholesterol, alkaline phosphatase, gamma-glutamiltranspeptidase and leucin-aminopeptidase. Under treatment, the clinical status caused by the cholestasis (pruritus, icteric syndrome, hemoragipary syndrome) was improved in six of the given cases (16.22%). Before therapy, the hepatic cholestasis was present in 20 patients (54.05%), and after treatment in 14 patients (37.83%). During therapy, the average values for all the monitored parameters decreased: direct bilirubine (0.38 +/- 0.18 mg/dL vs. 0.34 +/- 0.24 mg/dL, p = 0.0867), total cholesterol (198.53 md/dL vs. 183.16 mg/dL, p = 0.0808), alkaline phosphatase (236.99 +/- 79.09 IU/L vs. 227.82 +/- 87.59 IU/L, p = 0.0845), gamma-glutamiltranspeptidase (47 +/- 32.89 IU/L vs. 43.91 +/- 29.66 IU/L, p = 0.1509), and leucin-aminopeptidase (32.33 +/- 13.22 IU/L vs. 28.95 +/- 14.22 IU/L, p = 0.0038). Under antiviral treatment there was noticed an improvement of the cholestasis clinical status in a small number of cases. Antiviral therapy favorably influenced the liver cholestasis associated in patients with chronic hepatitis C in a rather small proportion. Under Interferon pegylate and Ribavirine treatment, low levels of direct bilirubine, cholesterol and enzymes were found. Hepatic cholestasis and, especially, the high serum values of gamma-glutamiltranspeptidase have a negative influence upon antiviral therapy, causing the low sustained virological response. The celiac ganglia and the visceral plexus are complexes structures, disposed in the proximity of the main collateral branches of the aorta. Pre visceral ganglia are sympathetic ganglia chains between the lateral vertebral sympathetic chain and viscera. Our study is made in the anatomy lab on 30 adult human bodies, one of new born and 10 human fetal specimens with crown-rump lengths from 9 to 28 cm. It was used the argental impregnation by Bielschowsky on block and Trichrome Masson methods for microscopic evidence. Prenatal, celiac ganglia are not a good defined morphological unit. They show a delay of neuroblastic maturation, comparing with the par vertebral ganglia. The nervous functional unit is represented by the neuron. The ontogenesis of the celiac ganglia follows several stages. Then, the neuronal specialization and the functional neuronal maturation are processes based on the numeric and morphological remodeling of the neuronal connecting figure, pre ganglia and post ganglia. It is well known that nicotine that is a major toxic component of cigarette smoke induces oxidative stress which is responsible for the lung damages in COPD and cancer. There have been reported some cases of COPD in never smoking patients exposed to air pollutants. The aim of our study is to evaluate the morphological pulmonary changes in rats exposed to cigarette smoke respectively to solid combustible smoke and to establish the relationship between the exposure and the level of oxidative stress measured through serum (s) and pulmonary tissue (l) MDA in rats (TBARS method). Thirty Wistar rats were divided into three groups (n = 10): (1) the control group (C), (2) the cigarette smoke group (CS), and (3) the solid combustible smoke group (SC). Apart from the control group, these were treated with solid combustibles smoke or cigarette smoke for six months. We collected blood for serum determination of MDA and the lungs were removed for histopathological analysis and to determine the levels of malondialdehyde (MDA). The levels of serum and lung MDA were significantly higher in CS and SC groups compared with C group, but not significantly differences between CS and SC group were detected. These findings are positively correlated with histopathological changes (squamous metaplasia and clear cell hyperplasia in the bronchium epithelium, emphysema) found in pulmonary tissue. Preliminary data of our study confirms that not only the cigarette smoke but also the environmental pollutants are involved in the major pathways of COPD. The Holt-Oram syndrome or atriodigital dysplasia is an autosomal dominant disorder with near complete penetrance and variable expression, caused by mutations of the TBX5 gene (12q24.1), affecting one in 100.000 live births. Sixty percent of cases are familial and 40% sporadic. We present the case of a 24 years old male patient with a personal history of bilateral coxa vara surgically corrected on the right at the age of 8 years, complicated by osteochondritis, short stature (160 cm), underweight (37 kg, BMI 14.45 kg/square-cm), triangular face, micrognathia, down slanting palpebral fissures, hypertelorism, low set ears, scoliosis, narrow shoulders, shortened left arm, left thumb agenesia, limited supination, abnormal toes, hypoplastic muscles, atrial septal defect ostium secundum type, incomplete right bundle branch block, hypoacusia and normal intelligence. During a routine cadaver dissection, we have encountered an anomalous formation of inferior vena cava and abnormal channels communicating the two internal iliac veins with the inferior vena cava in a 67-year-old male cadaver. The said channels, which had a caliber of 5 mm on the left side and 15 mm on the right, arose at a distance of 26 mm on the left and 35 mm on the right from the internal iliac vein termination. Both the said channels moved medially, joined one another, and formed a common stem (Cs) which finally terminated at the junction of the termination of right iliac vein into the inferior vena cava. The lumen of the terminal part had a diameter of 18 mm and it was 20 mm in length. Anomalies of the inferior vena cava and renal veins occur infrequently but if unidentified can lead to significant morbidity during surgical exploration. An understanding of the embryologic development of the vena cava and its tributaries is necessary to understand the genesis of these sometimes-complex anomalies and their accompanying anatomic variants. Collision tumors are extremely rare and raise interesting problems related to histogenesis. In this paper, we report a case of collision tumor of the colon and review the literature related to this subject. Adenosarcoma is considered as being a variety of mixed Mullerian tumor having a small grade of malignity. Present case refers to a perimenopause patient examined for a structure of bleeding endocervical polypoid. Diagnostic evaluation performed after biopsy revealed a cervical leiomyosarcoma followed by operation. The range of occurrence is interesting, having in mind positive and differential diagnosis problems that occurred. Mesenteric inflammatory veno-occlusive disease is a rare but recognized cause of intestinal ischemia, who can be defined as phlebitis or venulitis affecting mesentery or the bowel, without any evidence of coexisting of an obvious predisposing cause or a coexisting arterial inflammatory involvement. We report the case of a male patient, 63-year-old, admitted in the Emergency County Hospital of Craiova, who after presenting with an acute abdomen, underwent exploratory laparotomy and resection of the ischemic sigmoid, temporary colostomy and after four months we reintroduced descendent colon in the digestive transit. The resected specimen of the patient was examined histopathologically, and distinctive histopathological characteristics of the mesenteric inflammatory veno-occlusive disease were identified.